We found the most charming place to stay while visiting with friends in Southern Humboldt County. In the past we've camped while visiting Southern Humboldt. When we woke up to rain this morning, we were glad to have a roof over our heads! 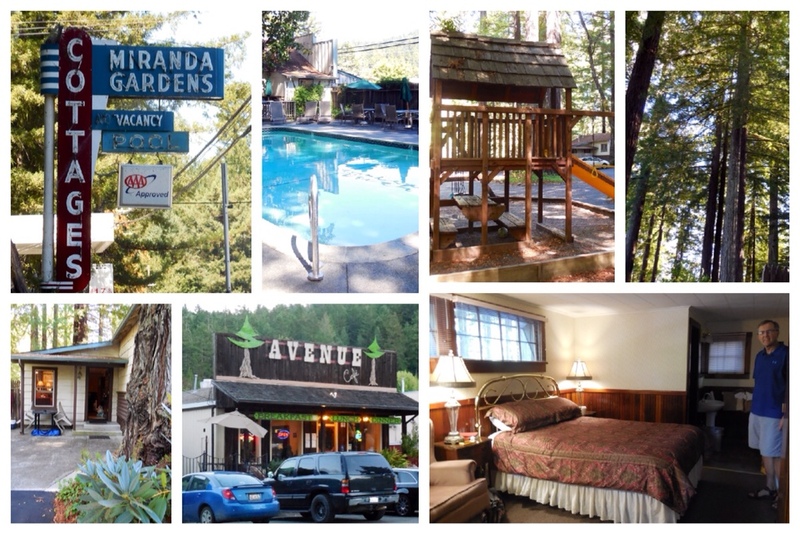 Miranda Gardens, located along California's beautiful Avenue of the Giants highway, offers something for everyone. There is a pool for hot Southern Humboldt summers, a playground for cooped up kids, soaring redwoods for relaxed afternoons, a continental breakfast featuring a simple but delicious array of breakfast foods…all this and more is available to you while enjoying the comfort of your own cozy cottage. We stayed in a studio cottage that provided us with plenty of room to spread out. We had a wardrobe to hang our clothes, two comfy chairs, a fridge and coffee maker and a private patio complete with table and chairs to relax and breath in the fresh forest air. There are also larger cottages with bedrooms and kitchens for families or extended stays. The Avenue Cafe, right across the street, is open for breakfast, lunch and dinner. We gave it a try tonight and were both happy with our pasta choices.